Last weekend I logged on to Elder Scrolls where I participated in my first guild event, a skyshard run in the pvp zone of Cyrodill. Skyshards are glowing spheres that give you one third of a skill point once and once only. Some bloggers, (Nils, I’m looking at you), didn’t like skyshards. I don’t mind them. They’ve built them into the game so obviously the skill points take this into calculation. And anyway, you can get skill points from quests as well. Lorewise, I couldn’t really care less. They’re a good incentive to see the world, go exploring if you will. And go exploring we did. 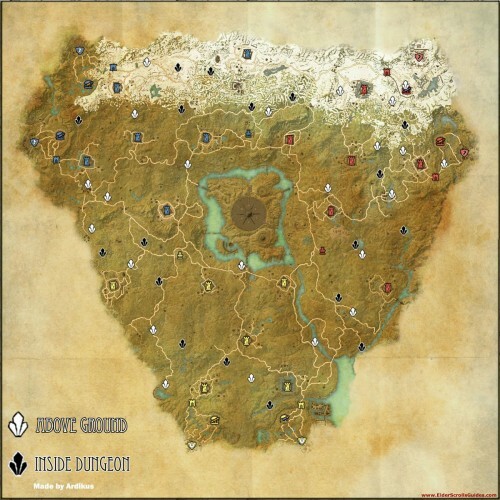 Cyrodiil is big. Really big. Here’s a map of it. They let me down politely. So I ran over to the nearest horse vendor and sank 17K on an ugly nag that looked as if it were destined for the knackers. I had been holding out for the most expensive option but events forced my hand. I rode back, (the horse animations in this game are quite cool), and we rode off. Everyone galloped off into the distance. Seems that you can level your horse in this game. Mine obviously wasn’t. I lent on the stamina button like an old man leaning on a street lamp on a windy day. Somehow we kept up. There were twenty of us in the group. I followed like a mad-man, learning my horsey skills on the way, space bar to jump, careful going downhill or you might dismount, avoid the water, stay clear of enemy PvP guards. I’m in Australia, I’m playing on the North American server, there were twenty of us and I had zero lag. Some of you might use this as an opportunity to pour scorn on the number of people playing Elder Scrolls, but it really ran well. The other nice surprise was group fights. Being used to the multicolored acid-toned visual attack chaos of WoW, this was a pleasant surprise. It was easy to pick out enemy combatants due to the lack of visual wankiness from spells and abilities. We poured around Cyrodiil like a storming rush of crazed harpies on crack. Occasionally a player from another faction would be unfortunate enough to stumble across our path only to be vaporized in a fury of bolts, arrows and spells. Two hours in and with over 20 skyshards under my belt for the run, I pulled the pin. The group went on to collect over 40 shyshards overall for the night. Excellent guild event, check. Games works seamlessly with many players in the one location from thousands of miles away, check. Enough skill points to rub them under my armpits while singing Ave Maria, check. Loving this game, double check. No, make it a triple.